Posted on Aug 6, 2015 by Appleton Downtown Inc.
Valley Transit has partnered with Mile of Music, the handcrafted artisan music festival coming to Appleton August 6- 9, to offer mini “pop-up” style concerts on the bus. The Mile of Music band wagon, a specially-wrapped Valley Transit bus, will operate Thursday, Friday and Saturday from 1:00 p.m. until 11:00 p.m. and feature 40+ free mini concerts. The 20-minute route begins at the Fox Cities Performing Arts Center and travels along College Avenue from Lawrence Chapel to State Street and connects with regular Valley Transit bus routes at the Transit Center. The main boarding location for musicians and passengers will be at the Fox Cities Performing Arts Center’s valet parking area but festival goers can hop on the band wagon along the route by waving to the driver to let them know they want to catch a ride. The bus will stop wherever it is safe to do so. 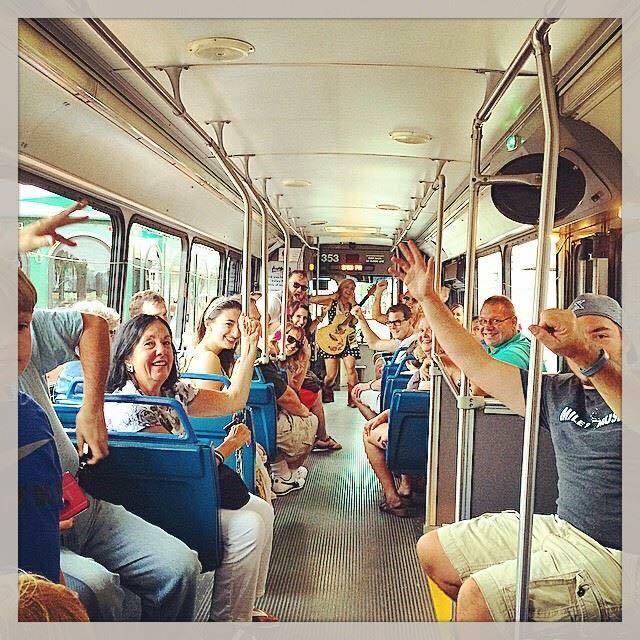 Valley Transit also participated in the Mile of Music festival since it began in 2013. “We’re thrilled to be a traveling venue again this year,” stated Valley Transit General Manager, Deborah Wetter. “The past two year’s events were a great success and we hear that bands were requesting to get back on the bus this year.” Ms. Wetter added that Valley Transit’s participation in festivals like Mile of Music are another opportunity to expose people to the benefits of public transportation. Musicians seem to like the bus as well. In the past few years, Valley Transit buses have been featured in several promotional pieces for local bands including posters for Cool Waters Band and Insight on Business magazine’s July 2014 cover story on Mile of Music.